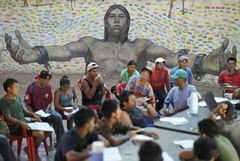 The Indigenous University - ARTE AMAZONIA provides a global voice through art for the indigenous cultures of the Amazon. Universidad Indígena de Venezuela (Indigenous University of Venezuela, UIV) is a public university created in 2010 based in Tauca, Bolívar State. Aimed at Venezuela's indigenous communities, it has campuses in Bolívar and Amazonas, and a 2010 enrolment of 810. The indigenous peoples of Venezuela make up only around 1.5% of the population nationwide, but the proportion is nearly 50% in Amazonas. It was set up several years ago by an indigenous rights organisation comprised of members of the communities and Jesuit priests who had worked with indigenous peoples for many years. The location is as much a mid-point between indigenous communities as it is possible to reach. Still many of the students travel for several days to reach the campus at the start of every term. Several different communities are represented and living on campus is a chance for students from different ethnic groups to mix for the first time. Organisers hope that eventually every one of Venezuela's 30 indigenous groups will send pupils to the university. Every morning, groups of tribespeople cross a jungle creek from their adobe student homes and wander barefoot through savanna inhabited by boa constrictors to reach class at Venezuela’s first indigenous university—Reuters reports. The original residents of Venezuela’s forests, Caribbean coves and swampy plains, dozens of Amerindian ethnic groups now make up only a fraction of the 29 million people in the South American country dominated by the oil industry. Like similar groups across the world, their habitat and way of life in a vast, long-neglected region of forests and waterways around the Orinoco river are increasingly threatened by illegal mining, ranchers and evangelical Christianity. Adding to the mix of influences are socialist aid programs from President Hugo Chavez, who has placed Venezuela’s Indian identity at the heart of his home-spun revolution. Many are grateful for the help, but others say it splits villages and draws them into cash economies dominated by non-Indians. “They offer me an outboard motor for my canoe, then I have to get a job to buy gasoline and oil,” said Najiru, a 23-year-old student, whose Warao tribe lives scattered in the delta at the mouth of the Orinoco. On a campus that sprawls from grassland into thick jungle, 100 students drawn from many of the country’s 44 recognized tribes are trying to fight back at the university, which teaches ancient customs alongside modern law and technology. “This university is the best hope for saving our cultures,” said Najiru, working on a plan for a forest farming thesis on a laptop in a dirt-floor hut. The goal is to create leaders who can defend land rights and prevent a headlong rush into modernity from destroying thousands of years of knowledge about forest and river life. Students and teachers are also racing to put into writing the wisdom of elders that is not being handed down orally as in previous generations and may soon vanish. “The elders are living libraries,” said teacher and Ye’kuana Indian Emjayumi Torres, 27, one of the school’s first graduates. Unlike peers who study in regular schools in Venezuelan towns and often sever ties with their rural homelands, these students need no city clothes for class. They sleep in hammocks and cook on open fires. Founded seven years ago, the Venezuelan Indigenous University is to be incorporated into the national higher education system this year. That will bring funds for classrooms and curriculum. It also carries risks. 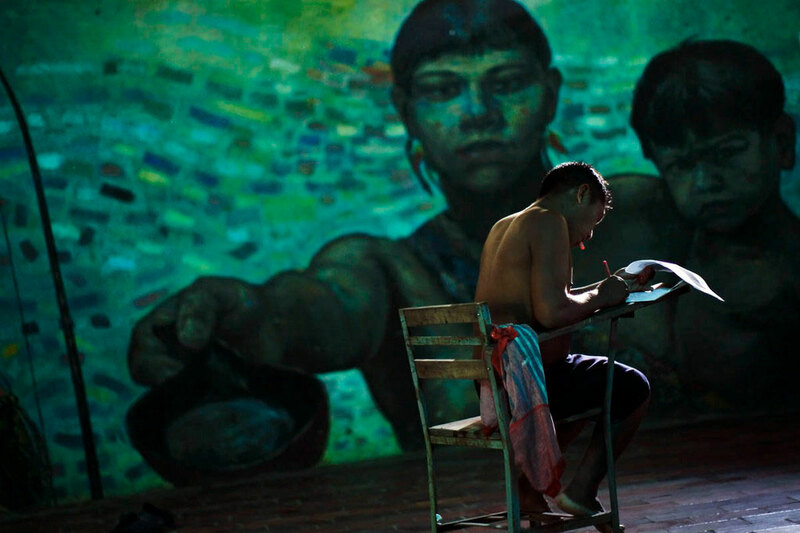 Torres, the teacher, chalks a timeline of Venezuela’s indigenous history across a blackboard in an airy classroom. A dozen students take notes, the faces of some painted with traditional symbols, others fiddling with mobile phones. Soon after taking office in 1998, Chavez created a new constitution which for the first time enshrines indigenous rights, including claims to long-occupied land. Chavez himself claims indigenous roots and the tribes’ support gives a home-grown identity to his revolution, along with the ideas of independence hero Simon Bolivar. Twelve years on, a government presence is common even in the most remote Indian villages deep in the Amazon, where Hercules cargo planes and helicopters deliver food, medicine and doctors. Therein lies the problem. While aid and government jobs are a welcome relief from the harsh reality of jungle life, for many Indians, Chavez is creating dependency and weakening traditional elders with politicized community councils. “They are going to wipe out these cultures in no time if these policies are not corrected,” said Jose Korta, 81, a Jesuit priest who is a founder of the university. He says money flowing into villages often ends up spent on alcohol in stores owned by non-Indian ranchers who have invaded their territory, pushing Indians to shrinking patches of land. The thorny subject of recognizing tribal land, much of which straddles borders with Colombia andBrazil and is rich in minerals, is bogged down as Chavez tries to balance economic priorities and sovereignty concerns with the obligations in the constitution. University alumni are mapping territory using GPS handsets to pinpoint hills and rivers that elders have identified for their tribes. Out in the villages, many Indians long for modern comforts, including protection against preventable diseases. In the village of Keipon, about 40 Enapa Indian families live in adobe huts nestled in a lush range of hills near a broad tributary of the Orinoco river. The Enapa hunt birds and grow rice, fruit and vegetables in family gardens. Most here work the land, unlike other hamlets where government cash lets many buy subsidized food that can cause dietary issues as pasta and flour replace traditional fare. Like most Indian groups, the Enapa have long been in contact with the world but now face faster change. The government, Evangelicals and university graduates are all jostling for influence. “We need a more comfortable life,” said village nurse Kushewa, inside a crumbling adobe clinic, stocked with a small range of medicines. Officials have approved funds to build a new brick clinic, but so far only the roof has arrived. “We have no transport and when someone falls sick here we have no way of taking them elsewhere,” he said. The government also gave simple laptops to a dozen schoolchildren in April. But there is no electricity supply, so the computers can only be charged with a small generator, when villagers have gasoline to spare. Funds won by the government-aligned community council were used to build houses with gleaming zinc roofs in the center of the village. Though liked for offering less refuge for snakes, they are so hot that in summer families move back into their old palm-roofed homes for relief. One man, Wine, returned to Keipon after graduating from the university. After consulting with villagers, he helped pipe clean water from a mountain spring into homes. That’s the kind of approach the university is seeking: changes that improve people’s lives without destroying their traditional ways and are not imposed upon them. But there is a bigger change to life in Keipon. Last year, one family converted to Protestant Christianity, and now half the villagers have followed suit. Elsewhere south of the Orinoco, entire villages have switched from Catholicism, which most indigenous groups have some allegiance to and often tolerates pre-Hispanic customs. Pre-school teacher Yaneth Avila, 23 gives classes in Enapa. She says religious schisms cause tension and could end rites such as a month-long mass-naming ceremony for young children. “We are practically losing our culture because Creole ways are squeezing in, we are switching one culture for another,” said Avila, breast-feeding her baby as parrots flitted by.